A dangerous biker who raced past police at ‘more than 180mph’ and used fake numberplates to try and cover his tracks has been jailed for 30 months. Gym owner Paul Whyatt (57) outpaced police during two high-speed chases but was caught out when officers reviewed dashcam footage. 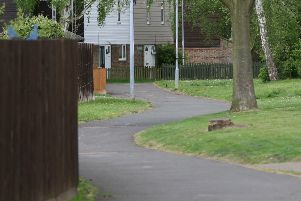 Whyatt, of Wisbech Road, Thorney, was criticised for “his arrogance and stupidity” by Judge Gareth Hawkesworth, in particular for attending a police interview with a recognisable rucksack which identified him from the high speed chases. That rucksack also contained a sheath knife which was uncovered by police. Peterborough Crown Court also heard that Whyatt had a previous conviction for dangerous driving and driving without insurance from 1999 when he was involved in a police chase in the Isle of Man which ended with him crashing into somebody’s back garden. Whyatt was sentenced on Thursday (March 9) having previously been found guilty by a jury of two counts of dangerous driving and two counts of perverting the course of justice. Whyatt had previously pleaded guilty to possessing an bladed article. Judge Hawkesworth said: “You provided bizarre and fanciful evidence to justify what the jury found to be an essential lie because you indeed were the driver on each occasion. “Your driving was unlawful - you did everything you could to escape responsibility for that driving. One count of dangerous driving from April 9, 2015 saw Whyatt travelling on the A1M southbound from Sawtry to Huntingdon using numberplates registered to a car in Hampshire. Judge Hawkesworth said: “Police were doing 148mph but the bike was speeding away from them. You’re aware your motorbike goes beyond 180mph - I believe you were doing the top speed. The next incident of dangerous driving saw Whyatt go from the Paston Parkway onto the A47 towards Thorney, again reaching speeds above 100mph. In Thorney he reached speeds of 60mph - double the limit - then sped past cars waiting in traffic on the B1167 Wisbech Road before racing off towards Holbeach. Because Whyatt was this time using the correct numberplates, police reviewing footage on their dashcam were able to trace him to his home address. When interviewed Whyatt claimed an acquaintance at the gym he owns was doing a test ride with a view to purchasing the bike, the court heard. However, no gym records of the acquaintance could be found, and police saw CCTV footage of Whyatt in his gym wearing the same distinctive clothing the speeding biker had been wearing. This was the first count of perverting the course of justice. The second related to an incident in August 2013 when Whyatt was clocked doing 47mph on the B1167 Wisbech Road, Thorney, where the speed limit is 30mph. When questioned by police Whyatt gave a false name for the driver. Whyatt also used false numberplates in another incident where he overtook an off duty police officer on solid white lines before speeding away.